As a painter, one’s influences are unstable and sometimes inexplicable, viewed through the lens of time. For example, for the life of me I cannot remember anymore why I once loved Francis Bacon so passionately. I now find him mannered, repetitive and arbitrary. But there has been a reproduction of one Rothko or another in my studio since I first started painting. So I went to Tate Modern in a state of apprehension (might it let me down?) and exhilaration (might it give me a welcome push?). 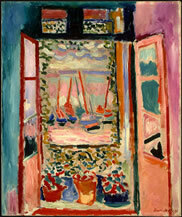 Henri Matisse’s influence on Rothko has always interested me and he must have known the seminal painting Open Window at Collioure, painted in 1905, that introduced Fauvism to a wary world. Dominated as it is by two strong, fuzzy, vertical rectangles and lifted by a horizon glimpsed through the eponymous open window, it came to mind forcefully in the crepuscular rooms of a dimmed–down, hushed Tate Modern. It is probably strange and even heretical to posit an advocate of painting who requires art to be “decorative” (a dirty word surely even from Matisse?) and “comfortable like a good armchair” against an austere apostle of art whose work, in Rothko’s words is about “the human drama” and the “tragic”. In a simplistic, reductionist way one tends to think about Matisse as the incarnation of an Unbearable Lightness of Being and Rothko as a High priest of the Dark. 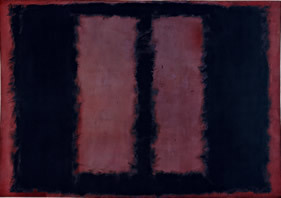 But you come away from this breathtaking show at Tate Modern with a very different view of Rothko. The high wire act that walks the edge – the edge of the colour, the edge of the canvas, the edge of the light, the edge of sanity – is omnipresent in the works of both artists. Quavering bands of line bleed into areas of saturated colour that laps and drags into itself. There is a dynamic balance of what seems hardly there against strong, forceful shapes. There is a joy in this, and who would have thought joy could come from a Rothko show? His work requires a patient eye. It does not deliver the immediate punch of Matisse. He is admittedly often demanding company, but this is a show that Rothko’s work richly deserves. It is beautifully hung, beautifully lit, and beautifully argued. The central gallery gathers together many of the 30 paintings that Rothko painted for the Four Seasons restaurant in the Seagram building in New York. This ill–fated commission was originally only meant to consist of nine paintings. 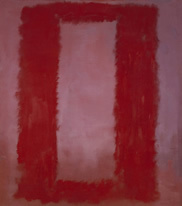 Its huge ambition makes one think of Michelangelo and the Sistina – another of Rothko’s heroes. 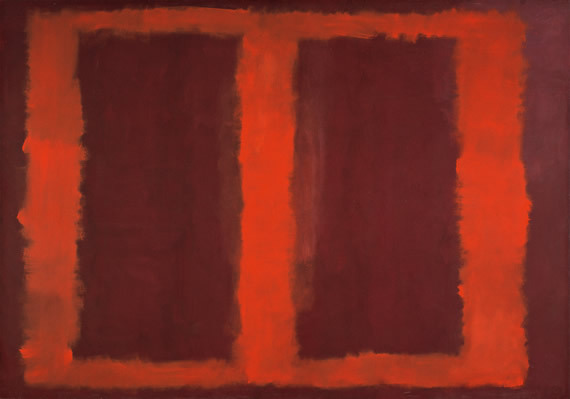 And it terminally taxed Rothko’s allergy to the elitist New Yorkers who would have dined under these huge, smouldering canvases. He paid back his advance for these works, never delivered to our eternal gratitude, kept them, and now they belong to the world of museum goers, not ladies who lunch. Eight are now culled from the Tate collection; the others are a selection from the Kawamura Memorial Museum and the National Museum of Art in Washington. These works are ravishing. The eye loses focus and one’s gaze melts into the canvases, only to be “awoken” by small, dangerous brush fires where one colour meets another. In the last room, the Black on Grey paintings from 1970 – the year of his suicide – are a revelation. These supposedly minimalist paintings have an inner glow where “grey” meets “black” that is transcendent. Thinking about the “moon walk” two years before, these pictures seem to gaze out into the empty space of the universe from the brightly–lit surface of the moon. I think these ARE horizons. His is a truly human presence in a world empty of humans. He may have lived on the edge – and maybe this is the stuff of myth – but here in this final gallery we see a beautifully crafted and subtly calibrated balance of emotion and thought. This is the show of the year. Rothko is at Tate Modern until 1 February. Open daily, late nights on Friday and Saturday.